An article by John Oakes about recent archaeological discoveries in Edom and Israel. Add two to the "we’re not surprised" category of archaeological finds in Palestine. For reasons that are at times hard to understand, archaeologists have moved increasingly in the direction of skepticism toward biblical history, despite mounting evidence in its favor. They have questioned not only the accuracy of the biblical account of Exodus, but even doubted that there was a distinctly Jewish state before the eighth century BC and confidently stated that all or virtually all the Old Testament was written after the destruction of Jerusalem in the early sixth century BC. Of course, archaeologists ought to be skeptical of all claims, as this is required of their profession. It is their job to challenge historical theories-even ones gleaned from the Bible. Add to this the fact that in the past believing archaeologists have made some overconfident claims which later had to be retracted. However, one gets the impression that the majority of scholars take a perverse pleasure in finding excuses to publicly question the accuracy of the Bible’s historical accounts. They seem to forget that lack of evidence is not evidence of lack with regard to biblical history when one gets the strong impression the same level of skepticism is not applied to histories from other ancient sources. The biblical books of Joshua, Judges, 1st and 2nd Samuel and 1st Chronicles describe Edom as a powerful rival kingdom to Israelite power all the way from the 13th century to the 8th century BC. To quote from an article reporting the recent discoveries to the Southeast of the Dead Sea, "Most scientists presumed the story of Edom was just that-a story rewritten so many times over the centuries that it became mythology." Continuing the quote from the rather blatantly biased archaeologist Thomas Levy of UC San Diego; "The Bible was put together in the 5th century BCE. It was thought that any allusions to history before the fifth century must be pure myth." It is hard to fathom how ignorant a statement this is, coming from a professional archaeologist. Did he not pay attention to the discovery of the Tel Dan Inscription (proving beyond a doubt that King David did in fact live and establish a dynasty in Judah in the 11th century BC)? Is he not aware of the Silver Scroll (a copy of Numbers 6:24-26 from the 6th century BC)? But let us give credit to Thomas Levy, the director of The Levantine Archaeology Lab at UCSD for admitting that he may have been wrong on this one. 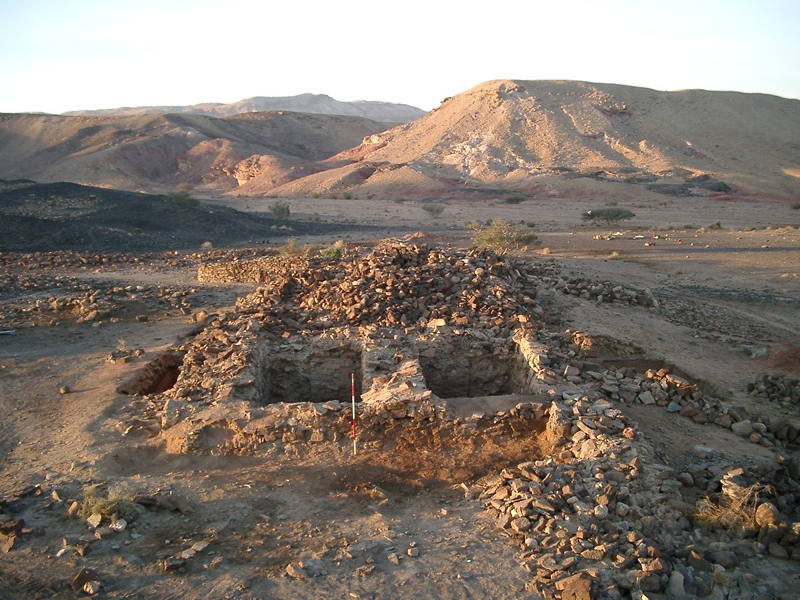 In a paper published October 27, 2008 in the Proceedings of the National Academy of Sciences Levy reports the results of excavations at an Edomite settlement in Southern Jordan at a site known as Khirbat en-Nahas (ruins of copper in Arabic). Here he discovered evidence of extensive "industrial-scale" copper mining and smelting from the 10th and 9th centuries BC. The mine works were scattered over an extensive area. Levy’s group excavated twenty feet of layers from occupation of this large settlement over several centuries, finding evidence that "indicates the Edomite society was sufficiently advanced to have posed a threat to the reigns of David and Solomon." The lower levels showed evidence of a comples, organized Edomite state as early as the 12th century BC, putting it well into the period of the Judges. The evidence points to the highest activity during the reign of Solomon, which would be consistent with the biblical statements about Edom. We may be looking at one of King Solomon’s mines says Levy. "I think it throws the question back out there." Here we have an archaeologist in the field who admits that his starting point all along has been to assume that the Bible is just a bunch of mythology unless confronted with smoking gun evidence to the contrary. The problem with this is that there is already plenty of such evidence out there. Will this discovery, further evidence that the biblical view the history of the Near East is the most reliable source we have by far, tip the scales toward a more reasonable view from the archaeological community as a whole? One can only hope. Archaeologists from Hebrew University, working at a site known as Elah Fortress which looks down on the Valley of Elah, have discovered a pottery shard with five lines of Hebrew text in black ink. The Valley of Elah is about 12 miles from Jerusalem. It is the site of the battle in which David killed Goliath. Carbon dating of artifacts discovered with the pottery shard places the discovery at about 1000 BC-close to the time of the battle in which Israel defeated the Philistines. It is wise to be circumspect about this discovery, as the text has not yet been fully deciphered. It is not clear whether this text contains words from the Old Testament. The group from Hebrew University have identified the Hebrew words "judge," "slave," and "king" in the text. 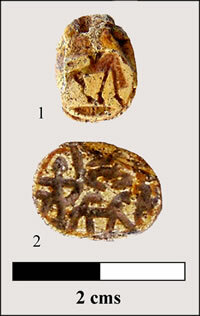 It is hoped that this artifact will shed light on the state of Hebrew script at this very early date. The work at the site has produced evidence there "was most likely a strong king and central government in Jerusalem during the period scholars believe David ruled the holy city and ancient Israel." The discovery of this text of Hebrew from the late eleventh century will probably not prove to be some sort of "smoking gun" for the biblical text itself, but it represents a trend. Almost every month a new discovery is made in Palestine which supports the biblical picture of the area at the time the events recorded in the Bible occurred. Archaeologists who specialize in the Near East would do well to change their rhetoric and no longer call the biblical accounts in Judges, 1st and 2nd Samuel and 1st Chronicles "myths." It has been estimated that only about 10% of archaeological sites in what was ancient Israel have been excavated. I am prepared to place my bet that there are many more exciting discoveries waiting to be made. I am also confident that the recent trend will continue. With every discovery, the historical accuracy of the biblical histories will be supported and confirmed. The Implications of Evil in Our World	Where in the Bible does Jesus say he is God? Why do people believe the Bible is corrupt?